With Valentines just around the corner love is in the air and I’m loving all the adorable things you can do with paper! I found myself once again at Paper Source where they have an assortment of kits to make fun valentines decorations. In the photos below you have hanging decor, a wreath, cute kid valentines, and make your own cupcake kits. I love Pinterest and honestly who doesn’t. One could spend hours scrolling through pages and pages of amazing photos so I picked some of my favorite pics. The wreath and bouquet of life like roses are truly amazing. While the hearts garland make for fun decor and the printed fortune cookies a great valentine! To see more of my favorites check out our Valentines Pinterest board. Congratulations Lianne Albert-Seumanu our February Bride of the Month! With the ground hog seeing his shadow they’re saying six more weeks of winter. 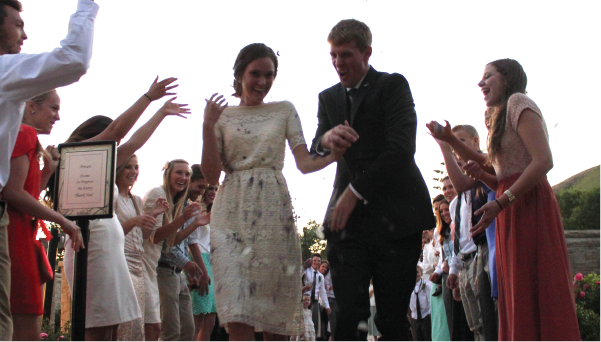 So I decided we need a bride who’s wedding takes us to warmer days; Lianne’s wedding was just that! Surrounded by family and friends this Polynesian themed wedding had everything, from groomsmen wearing traditional ie faitaga and a wide variety of food including the best-shaved ice you can get in Utah. Bekka: Lianne did you know what style of invitation you wanted and how did it all come about? 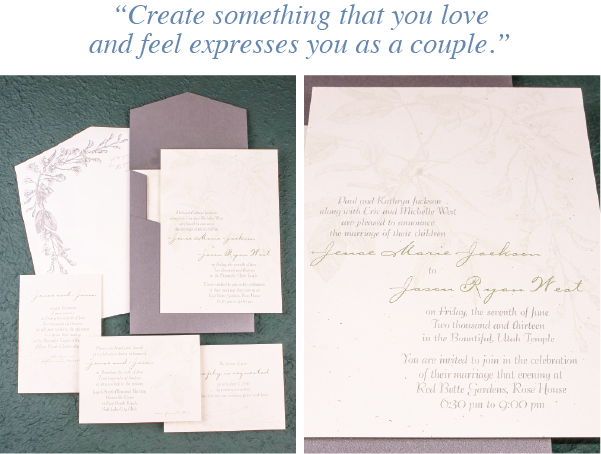 Lianne: I had a really good idea of the style of invitation I wanted before I went in. I knew I wanted something classic and more traditional. I knew exactly what I wanted my fonts to be, and colors. I just didn't know what I wanted the rest to be like. Ruth was great though in helping me and really listening to the overall feel that I wanted. My invitations turned out perfectly. 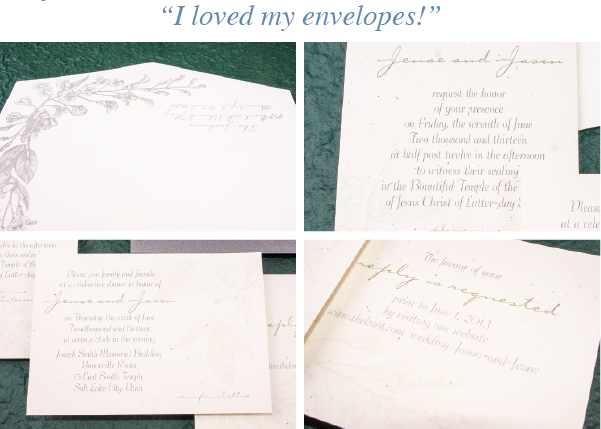 Lianne: My favorite part of the invitation was the quality and how clean and classic it looked. I loved the magnolia flowers that were carried throughout the set on the invitation and the envelope. I really feel like the high quality of the paper and the letterpress made it perfect though. When people opened their invitation, I know they were saying "Wow! That's really nice!" And that set the tone for the rest of the wedding festivities. Lianne: Yes, they set the tone for the entire event! I am a firm believer that the invitations should do just that! 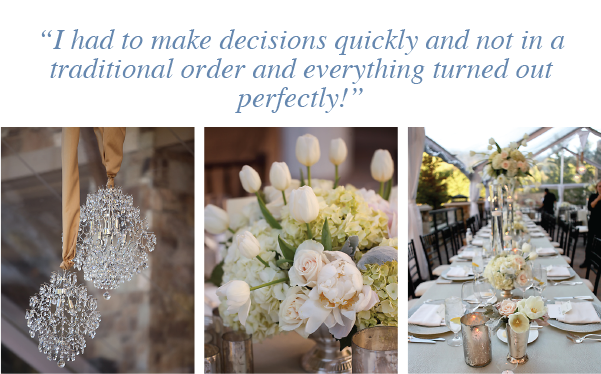 Bekka: Tell us about the vendors you chose to help create your amazing wedding! Lianne: My gown is a custom Anne Barge purchased from Alta Moda Bridal. The staff at Alta Moda especially Rachel was incredible! My dress was perfect! My bridesmaids wore navy blue dresses from eshakti.com (custom). I had such a wide-range of girls in my line I wanted them to be comfortable. I found this awesome website that made dresses based on measurements (regular and plus sizes) even added sleeves and length. It was PERFECT. My photographer Amee Sorensen Photography is originally from New Orleans and works in Utah and Louisiana. To say we had an instantaneous connection would be the understatement of the year. She completely understood the "Louisiana" influence on the wedding. My florist was Every Blooming Thing. They really brought all the details they created together for the big day especially the centerpieces for the reception. They executed my vision perfectly. It wouldn't have been as beautiful if it weren’t for them. I used One Sweet Slice to make a 9-tiers...all cake. Simple and elegant and could not be happier with the outcome! They incorporated a southern charm pull for my bridesmaids too! The food was Catering by Bryce. He did the majority of the food and was so easy to work with. We ended up adding 150 servings of food with him the week of the wedding because we realized we were expecting more people than originally anticipated. The food tasted AMAZING!!! I never really wanted a buffet-style reception eating, but cost wise it was the only way to go. Every Blooming Thing did great big centerpieces for the buffet tables. It was as nice as it could be, and we fed 800 plus people. FAST! To add as a supplement to the shrimp scampi and grilled chicken Bryce did, my husband's family did three traditional Samoan dishes for the wedding; taro, palusami, and povi masima. Taro is a starchy root sort of like potatoes. Palusami is coconut milk wrapped in banana or taro leaves and usually steamed. Povi Masima is a salted beef brisket. Some friends of our family did a kids table for us to feed the younger ones. They did fresh chopped fruit with li hing mui powder (red sweet, sour, salty tasting powder), BBQ Teriyaki Chicken, and steamed rice. My uncle brought in fresh ahi tuna from Hawaii and we had an authentic Hawaiian ahi tuna pok?. It's kind of like sashimi. We served those in small cups for everyone. WHAT'S A POLYNESIAN WEDDING WITHOUT FOOD…FOOD...and MORE FOOD! Funny thing is, that's how they do it in Louisiana too. Hokulia Shave Ice is the best authentic shave ice you can get outside of Hawaii. THE BEST! I came across Chrisstine's Linens and Things on the Internet and rented the majority of my linens from them. They were super inexpensive and VERY accommodating! I would recommend them to anyone and everyone! They are a small company run out of their home (mother and daughter), but they ordered in the material and sewed my linens in time for the big day. It was perfect!!! Amy at Diamond Rentals SLC location was the best! She had a solution for every "problem" that came up. The day of it started to rain and because using the outside of the venue was a must because of how many people would be there, we HAD to rent a tent. I was not a fan, but my brother and uncle went and met with Amy. Rented a tent and a chandelier for the tent. It was as perfect as it could have been. Bekka: I heard there were some problems with the men’s attire; tell me a little bit more about what happened. Lianne: They wore grey traditional ie faitaga. We originally ordered it from Samoa, and the color was all wrong. Luckily, I knew someone that knew someone that was coming from Samoa to Utah and would make 'light grey' ones for us. What are the chances? They wore it with white on white Polynesian print shirts and sandals. Bekka: Lianne we loved having you as our client and thank you for taking the time to talk with me and share all the fun details of your wedding! We’ve seen this trend all year “Lace” and it is showing up everywhere from the clothes we wear to the decor we buy for our homes. At Ann Elizabeth we are privileged to create beautiful pieces of art thru our invitations and lace has been, and continues to be, a soft yet elegant way for our clients to express themselves on paper. We also love seeing how other vendors in the wedding industry are using lace so I thought I’d share some of my favorites. The first invitation set is Reaback-Sutton. 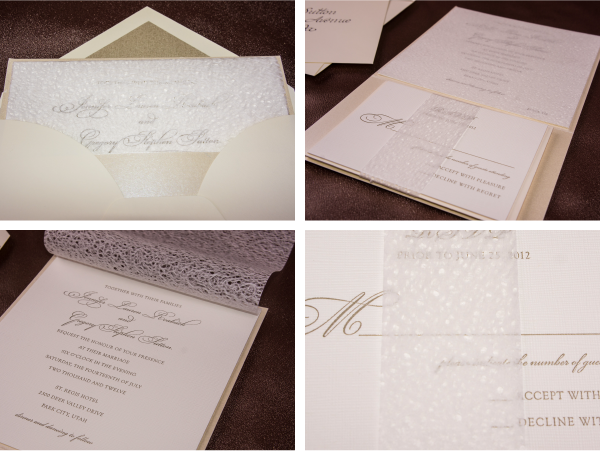 This is a beautiful combination where textured and metallic papers meet letterpress printing and complete the look with a lace paper overlay along with a lace band to hold the reply card giving this invitation an extra touch of elegance. This lovely bouquet was made by Calie Rose Floral and Event Design. Their bride Mandie Maughan-Krause is featured with her bouquet in the Utah Valley Bride Magazine and was on the cover of the Spring 2013 issue. 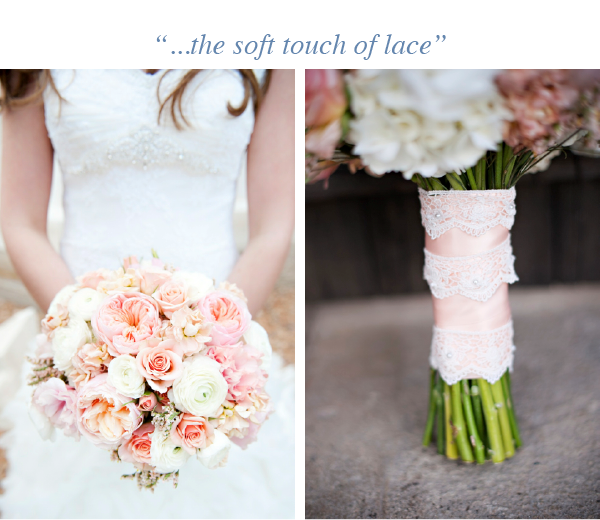 Calie Rose did an amazing job designing her bouquet taking her colors of blush, cream and light mocha then adding the soft touch of lace complementing the lace bodice of her wedding gown (purchased from Veronica Michaels). 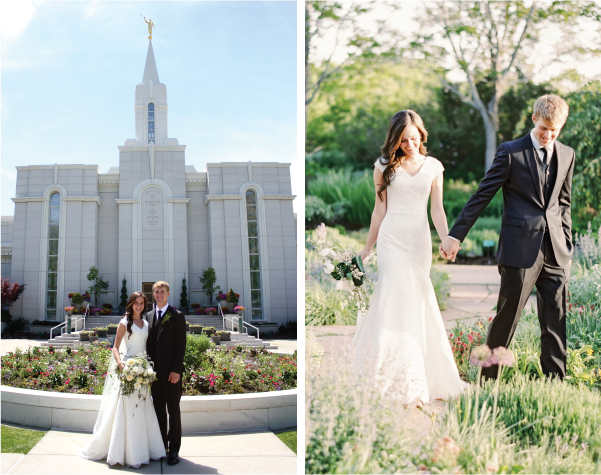 Kristina Curtis Photography really captures Mandie’s romantic vintage theme throughout her wedding and you can see more pictures from Kristina in Utah Valley Bride Magazine. 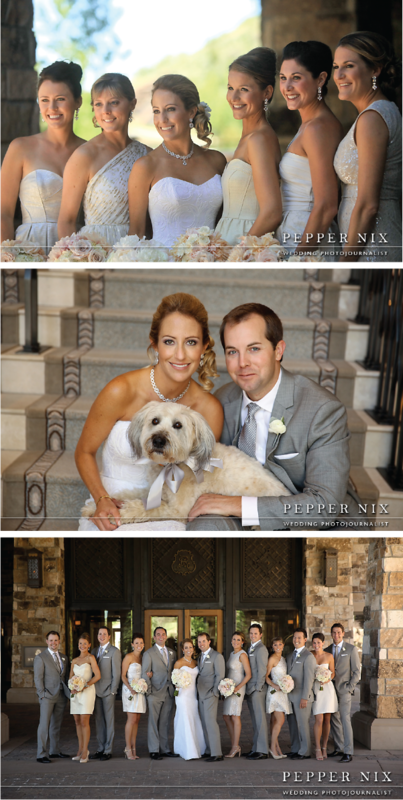 We had the pleasure of being invited to create the invitation suite for Utah Bride Blog fall editorial shoot in 2012. So I wanted to share how Ann came up with the creation of the “Leather and Lace” invitation and how last fall her inspiration was already setting the lace trend for 2013! After a couple days of brainstorming ideas Ann woke in the middle of the night with the thought of “Leather and Lace” and quickly sketched out a horse head idea with lace behind it. When creativity hits you write it down so you can remember it later! Using straps of leather tied around an invitation with a lace layer and a horse head monogram applied directly to leather gave this unique invitation a “balance between hard and soft elements.” Keeping the flow of the theme she added a lace envelope liner for the RSVP. Then to remind guest of the invitation she used a touch of lace, and a horse head tag tied with leather on the menu completing this invitation suite! 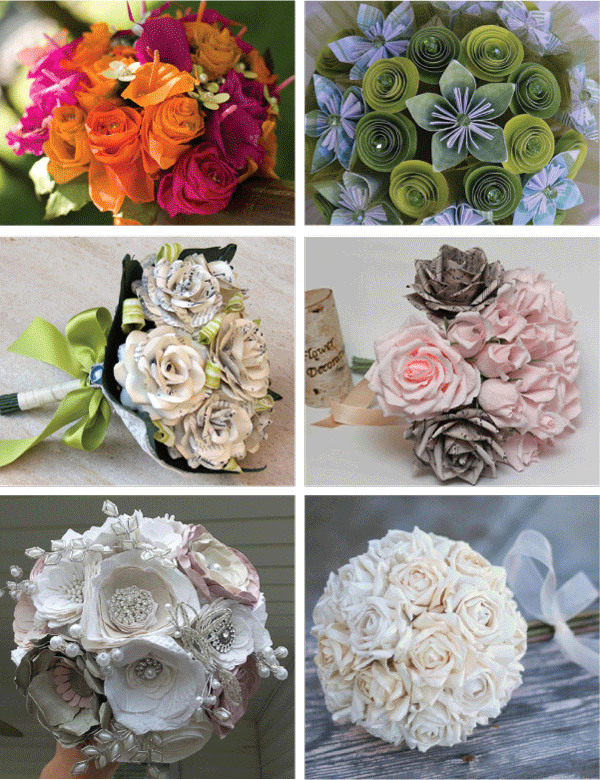 This week I thought I would talk about something a little different and creative, Paper Bouquets! When I was looking at all the different things you could do with paper and printing I stumbled across paper flowers and was blown away by the talent it must take to create such an arrangement. 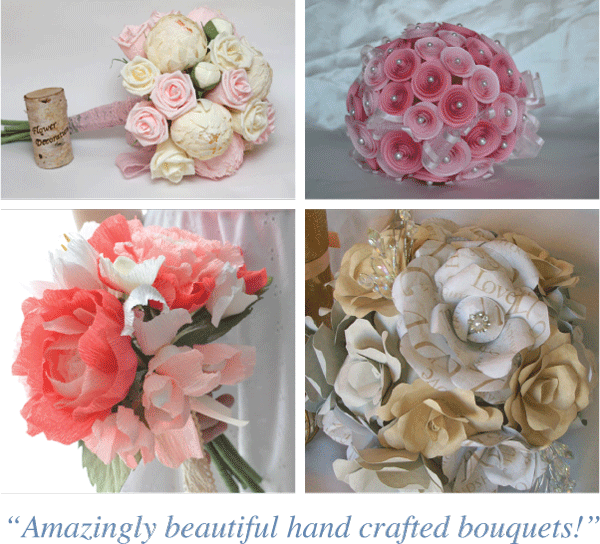 Over on Etsy is where I found some of my favorite paper bouquet pictures that are shown on our blog and the talented people who are making them! So if you were looking for something different than a traditional fresh flower bouquet this would be it! Plus it’s a unique way to have a bouquet that would last forever. I also discovered at Paper Source a kit you can buy to make paper flowers. I don't know about you but I'm definitely ordering this for a fun project to do with my daughter! Here are the links for all the pictures used in our blog starting with top going left to right.